simply going to include the generated localization files from 0.35beta. the commit tagged as "0.36beta" then debug/fix it. - Fixed "Error: ImhoBags/ItemContainer/GuildBar.lua:103: bad argument #1 to ''pairs'' (table expected, got nil)"
- Fixed "Error: ImhoBags/Item/Storage.lua:172: bad argument #1 to ''pairs'' (table expected, got nil)"
- Added new category "Minions"
- Added new category "Fishing"
string comparisons; therefore, it may only work for English clients. * Dream Bolts will once again be sorted into the 'Dream Weaving' category. * Artifacts will once again find themselves in the 'collectibles' category. * Fishing Artifacts will now appear in the 'collectibles' category. to Zorba (the addon dev) and hopefully he'll have a chance to fix it in the near future. * When sorting by 'rarity' the items with the same 'bind' and 'rarity' will then be sorted by name. select the number of seconds the addon waits (after an inventory change) before updating the window. and then will not update again until # seconds has elapsed without any other inventory changes. and the default value is 0. * Fix for several 'performance warning' errors. 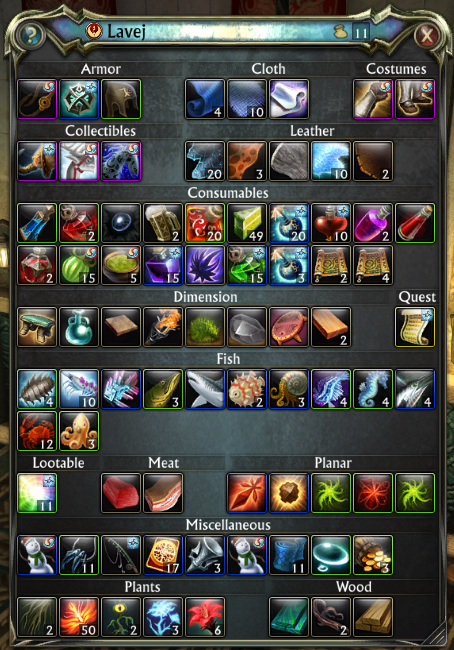 "bind on pickup" items first, then items that are "bind to account", followed by "bind on equip"
items, and finally the rest. save its location for future use when the window is closed or you logout/exit game/reloadui. while in combat (i.e., when the system is "secure") is forthcoming. * Added code to reduce 'performance warning' errors when opening the Configuration Window. However, there is no functionality changes whatsoever with this feature. "search database" window has always worked: case-insensitive by item name. * Fixed a bug in which moving multiple stacks of items that have a "quantity"
in buttons not working properly. to this version.) If you have a lot of bank vaults, you may get a "performance warning"
your window positions/configuration, sort options, etc.